Moody Monsters reveal their feelings through their exaggerated facial expressions, and this book and activity set includes brightly colored stickers, finger puppets, and a play stage backdrop (about 8½ inches high) for youngsters 3 to 6 to enact their own Moody adventures. 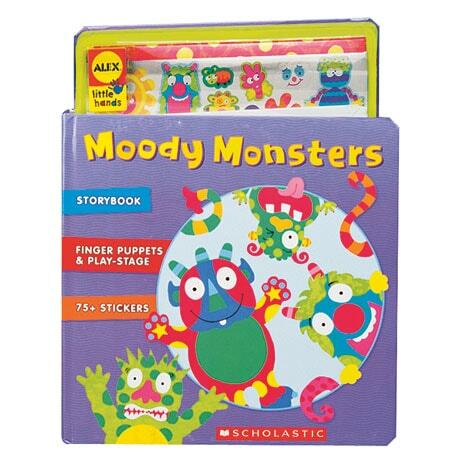 The book tells the story of Scared Sam, who is moving into Moody Monster Manor, even though he's worried about whether the other monsters will be nice and what his bedroom will be like. As Sam explores the house, and as he meets Happy Harry, Confused Carl, Tired Tilly, Hungry Hank, Love Lulu, and the other Moodys, he finds that some of his fears are calmed. The set also includes instructions and a parents' guide.